I was in the Red Rocks area on the last day of an extended roadtrip and needed to be home in the evening. With an 8hr drive ahead of me, this meant finishing up around noon. I decided to tag nearby Red BM (500ft+ prominence) along with a few of the summits in the Calico Hills that I had missed on my first effort three days earlier. 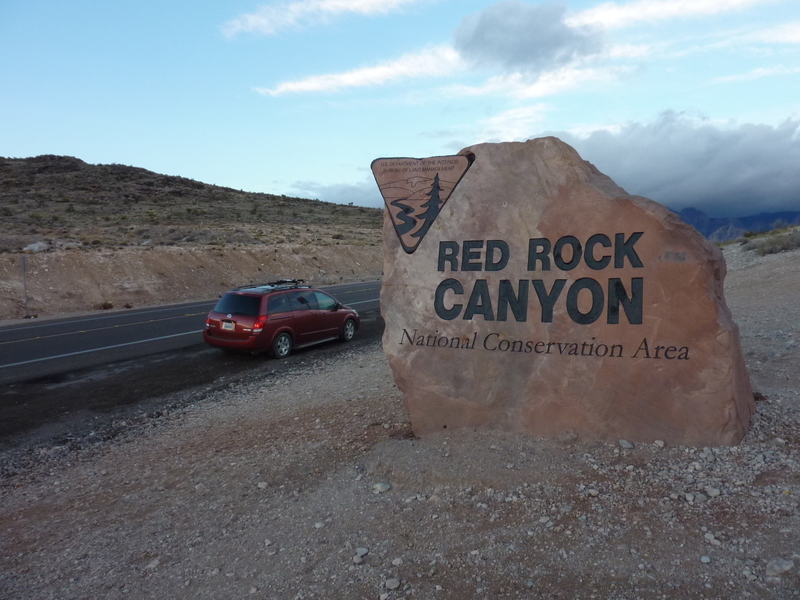 Located less than a mile and a half SE of SR159 and the north entrance sign to Red Rock Canyon NCA, Red BM makes for a short, easy outing. There is a large shooting range adjacent to the highway as one starts out. While some might find the noise disturbing, take solice knowing that your fellow Americans are practicing to defend us from tyrannical government and foreign enemies. If that doesn't provide any comfort, consider that they are dumping large sums of money in the form of spent cartridges and lead poured into earthen berms, money that they are otherwise not using to support causes you probably don't care for either. Still not happy? Perhaps do the hike in the early morning when the range is quiet. One can stay outside the range and on BLM property by following the ridgeline, or cheat a bit and use old roads inside the range east of the ridge (not recommended while class is in session). I spent about 45min hiking to the flat summit where I found a 1950 benchmark and the rusting remains of a tin that once served to hold a register. There is a fine view of Blue Diamond Hill to the west in the morning and of Las Vegas in the evening (though not so good in the morning when the view is washed out). After returning to the TH I drove a few miles west to Calico Basin and the Red Spring TH at the south end of the Calico Hills. I had done a half-day scramble around the summits to the north earlier in the week but run out of daylight for these other two to the south. In his book Rambles & Scrambles, Purcell mentions a traverse of these summits as a fine outing but never gives any sort of description, which in the end was probably a good thing. The route-finding is quite tricky and any such wordy description would probaby have been merely a source of delay and frustration. Getting to Calico Hills South is fairly straightforward from Red Spring. A boardwalk trail inside a fenced area gives one a tour of the small oasis formed by the spring. An unsigned trail goes outside the fence and can be used to access the main body of the Calico Hills. I headed southwest to gain the southern end of the ridge leading northwest to the summit of Calico Hills South, taking about 30min to reach it, nothing more than easy class 3. From here the going gets far more interesting - it took more than an hour and a half to cover less than a mile to the northwest. I found myself wandering around some huge cliffs on the west side of the ridge (the ridge itself looking far more formidable), wandering up and down various formations to link together a route to continue to Red Book Point. I came across a number of odd items including a panama hat, a bolted sport route and an unused porta-poop bag. Occasional graffiti can be found amongst the rocks - a sure sign of too-easy access from Calico Basin (to the east) and the Scenic Loop (to the west). There is a low saddle requiring a large drop as one nears Red Book Point (Google Maps labels this as "Guardian Angel"), the hardest part to figure out. I tried all sorts of ways to reach it before finding a key class 3-4 gully that led down, followed by another steep gully with chockstone tunneling leading up the other side. There were none of the usual ducks anywhere on this traverse, keeping me on my toes and making it a bit more fun than usual. Tired of looking at the Sno Park note. Congrats on blowing up Red Rocks !